The performance of a website may be the most important aspect of its success because if the ‘store is not open’ people cannot browse, buy and book. As the Internet matures, organizations rely more and more on the web for business- and mission-critical processes, and users are demanding faster, richer and more consistent online experiences. Today’s web 2.0 applications are more feature-rich and complex than ever. Applications have become "composite," meaning that their multiple elements assemble for the first timewithin the end-user’s browser. For instance, some of these services come from within your datacenter; some are delivered through content delivery networks (CDNs) and others from 3rd parties providing services and content such as ratings and reviews, ads, newsfeeds, ecommerce, and more. In fact, the average web application consists of 6 separate services — each of which impacts end-user experience, site availability and response time. So how can businesses thrive in this environment and have the same control over user experience online as store managers have over the experiences of visitors at brick and mortar locations? Applying the three monitoring "pillars" delivers a comprehensive and realistic view of site operations and their impact on business success. These three monitoring approaches are distinct, complementary, and equally important, each addressing core challenges you face. 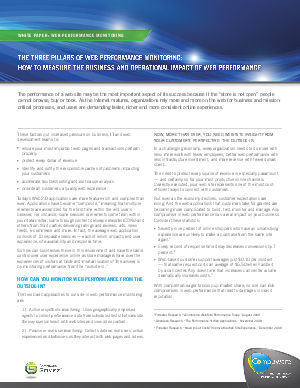 Continue reading to learn more about the three pillars of web performance monitoring.